Two massive petitions have been launched online, demanding that MSNBC fire its reporter Ayman Mohyeldin after he last Wednesday claimed on TV that an "unarmed" Arab terrorist was shot in front of him at Jerusalem's Damascus Gate. The problem with his reporting, as the show's anchor was forced to explain to him, was that the terrorist had been photographed with a knife clearly visibly in his hand as he charged IDF soldiers in an attempt to stab them, at which they shot him dead. In response, The Israel Project (TIP) on Monday evening launched a petition to get Mohyeldin removed from reporting on Israel, in a petition that has already garnered nearly 6,000 signatures out of a needed 10,000. "MSNBC viewers aren’t getting the facts. They are getting anti-Israel bias. NBC must remove Ayman Mohyeldin from the Israel beat," reads the petition. It noted several blatant false reports Mohyeldin was responsible for, such as when he claimed in last summer's war that the IDF struck a Gaza hospital killing civilians, when in fact an Islamic Jihad rocket was responsible. Mohyeldin, who formerly worked with Al Jazeera, likewise parroted Hamas's denial that it used civilians as human shields - despite video evidence showing Hamas openly calling for human shields. He further criticized the US for not having diplomatic relations with Hamas, which is officially recognized as a terrorist group by the US. "These are only a few of the criticisms of Mohyeldin for his reporting on Israel. Any one of them should be enough for NBC to remove him from the Israel beat to restore faith in the network’s impartiality," the petition added. "Tell NBC: Don’t let a terror denier be the one reporting on terror in Israel." Another petition was launched on change.org last Friday, and has already garnered over 24,000 supporters out of a target of 25,000, with just a little under 700 to go. Ben Leiblich who initiated the petition wrote, "Ayman has systematically provided biased reporting for NBC over the years, with his journalism frequently shown to be misleading and inaccurate under scrutiny." "This most recent episode in which he had to backtrack live on air on his claim that Israeli Defense Forces killed an unarmed civilian when the civilian in question was in fact a knife wielding attacker is only the latest incident in a string of biased reporting incidents of which NBC should be ashamed." "This petition is to have Ayman removed from our television sets and have him stop poisoning the minds of the less informed," concluded Leiblich. 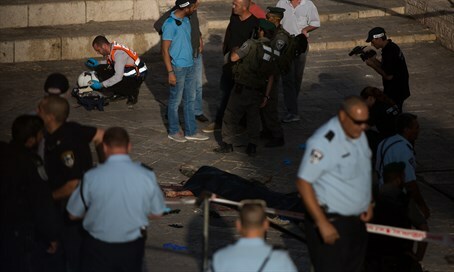 Ironically Mohyeldin's claim that the terrorist was unarmed mirrored the reporting by the Palestinian Authority's (PA) official paper Al-Hayat Al-Jadida, which ignored his stabbing attempt in painting him as a martyr murdered by the IDF. The article in the PA paper also described how Palestinian Arabs "insisted on inhaling the scent of the martyr's blood."